Pronology, a developer of cutting-edge tapeless workflow solutions and Small Tree, a provider of shared storage solutions, are announcing how their advanced technology systems offer users in production, broadcast and post, seamless and cost-effective integration and increased mobility, when working on high-profile, fast-paced projects. Pronology’s new award-winning mRes™ standalone multi-resolution encoder and Small Tree’s TZ5+40 portable servers work seamlessly alongside one another to ingest live isolated and switched camera feeds of a production, and are able to write multiple concurrent streams of HD and proxy video to the Small Tree appliances from Pronology mRes. Both solutions were used for FOX’s Grease: Live production and the 2016 MTV Movie Awards as storage for ingest, with all mRes media delivered to the TZ5s. For those productions, the camera feeds were encoded using mRes to multiple codecs at different frame rates. Then, the production teams were able to use multiple TZ5+40 portable servers with two 10GbE SFP+ ports and two GbE ports, and five 8TB drives in RAID5 to transport the media. The TZ5+40s were networked via 10GbE SFP+ connection points into the mobile truck’s 10GbE network fabric. Pronology’s CenterPoint Core™ software platform is often chosen to manage the enormous number of assets typically created for hit live television shows such as the 88th Annual OSCARS® and FOX’s Emmy Award® winning coverage of the FIFA Women’s World Cup Canada 2015™ event. The company recently introduced its new mRes standalone multi-resolution encoder, a critical component of fast-paced workflows. mRes, which was recently awarded NewBay Media’s Best of Show Award presented by TV Technology, records uncompressed video for each SDI input channel prior to compression and wrapping: a high-resolution media file, an edit proxy and a live web-streamable proxy that give users flexibility and ease of use at a low cost point and never miss a frame of action. A key feature of the new mRes encoder is how it integrates with most storage systems, such as Small Tree, while also easily integrating with most of the industry’s leading NLE systems. 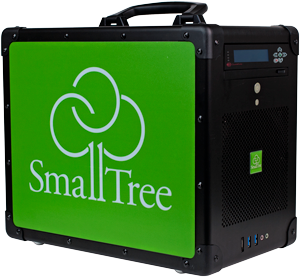 Small Tree’s TitaniumZ5+, part of the company’s popular TitaniumZ line, is a full-featured, high-performance mobile, all-in-one Ethernet-based video editing shared storage appliance with advanced file sharing capabilities. TitaniumZ5+ is designed to let video editors edit their content immediately to meet schedule requirements and deadlines in a mobile workflow environment. The server, networking and storage are all accommodated within TitaniumZ5+’s desktop design, which supports 2TB, 3TB, 4TB, 6TB and 8TB disk drives. Combined with the 2 GbE ports, the system is simple to set up and manage, allowing the storage to be available to users within minutes of initial start up. TitaniumZ5+ can also support up to 2 ports of 10Gb Ethernet if users need more performance.